When sleeves are one-in-piece with the bodice, it makes it easier to sew (theoretically - no shoulder seams! ), but doesn't necessarily result in optimal fit. In this truly excellent tip from Ruth Wyeth Spears and the 1920s, you will learn a couple of ways to resolve the dilemma if you are not one of the lucky ones with very straight and slim shoulders. 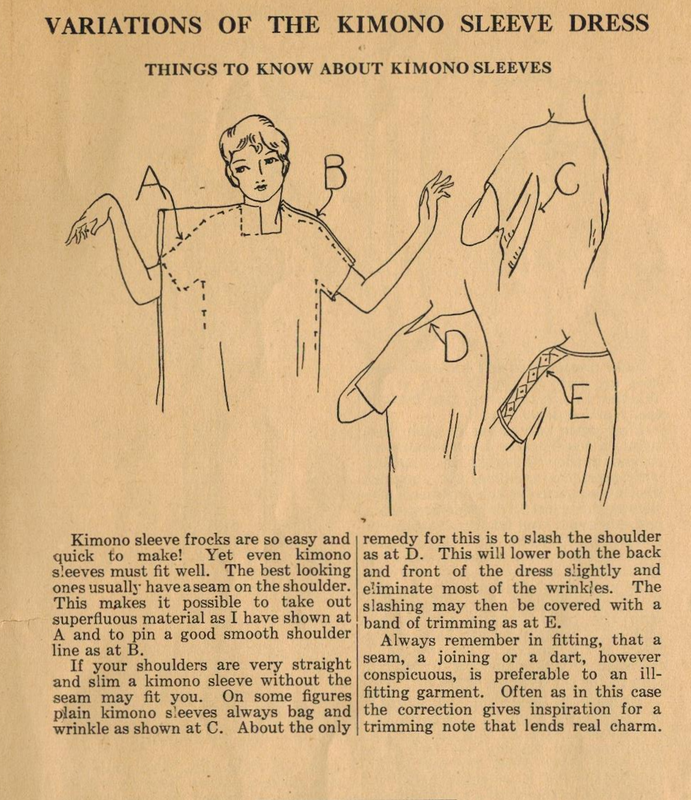 Kimono sleeves (also known as French sleeves) have remained popular throughout the decades, although I would say their peak was in the 1950s and early 1960s. Adding gussets under the arms is about the only addition made by pattern designers & manufacturers to improve the wearability of this style. Which makes this tip from Ruth very valuable indeed.